Guest blogging is one of the most effective but overused link building techniques today, but many people struggle with the practical part of the guest posting process. Guest blogging has helped many companies and bloggers increase their brand visibility online and attract loyal visitors and potential clients/customers back to their website. In today’s post, I’ll be sharing to you the white hat SEO guest blogging process that I have been implementing for our past and our current clients with great success. When Matt Cutts published a post on the decay and fall of guest blogging, many internet marketers and SEOs started to ask the question, is guest blogging dead? Though you will see a lot of answers and discussions on this topic (most of which are contributions from industry experts), the mystery answer to that question is still in search. All I know for sure is when done right, guest blogging is a highly effective traffic, branding & SEO strategy. Guest blogging is still alive. But the road trip to striking success with this method is not the same as it used to be. Today, you need to spend time planning a strategic approach (from prospecting to outreach phase) that will stand the test of time and will deliver great results for your brand. It’s one of the easiest ways to get in touch with industry bloggers/webmasters to build authentic relationships with them. It is a powerful tool to build a slow momentum of exposure and branding for startup companies or newly-built blogs. Getting consistent daily/monthly visitors if the campaign is targeted to high tier blogs that have active and engaged community of readers. Links from relevant blogs can help move up rankings for branded keywords, which will intensify the chances of getting press and interview opportunities. Contextual links from relevant and high quality blogs can help improve the site’s search ranking potential. When you do guest blogging right – the benefits are tremendous. It takes a bit of time & effort but that is time & effort that is very well spent. This new guest blogging approach is the updated version of the process that I created 8 months ago. I have refind the process to make it quicker, easier and most importantly to protect against Google changes during that time. The first thing we need to do is find a list of potential prospects that we might want to publish a guest post on. I’ve been using above queries for two years now and they’re still giving me some good list of quality blogs. Once you have a list of potential prospects you need to start thinking about contextual relevancy. Contextual relevancy is the principle of finding industries that are horizontally and vertically relevant to your brand. This allows you to see new thematic link opportunities that you haven’t thought of from the start (Pro tip: This approach also applies to other link building tactics). Why Is Contextual Relevancy Important? It extends your capability of targeting blogs from other industries that are also relevant to your niche, which might also bring new ready to buy customers/clients to your brand. Opens new partnerships from other brands in other niches that will help increase exposure for your brand (e.g. new partnered suppliers or manufacturers). So with that said how do we actually apply contextual relevancy to our guest posting campaign? Let’s say you own a running and corporate shoes company and you want to gain visibility online and hopefully attract potential customers through guest blogging. To get started, you need to list down all industries that you think are relevant to your brand. With that list of industries, you can now start prospecting for guest blogging opportunities using both free and premium link search tools. Chose any of the following products. These tools have good features that will help you find high quality blogs where you want your best content to be placed on. If you’re mastering competitor link analysis, Ahrefs is that tool that you need. It will help you search for linking sites that have high domain authority and are capable of passing quality link juice to your website. Reverse engineer your main competitors and list down all blogs that linked to them. This can populate your list up to hundreds of guest blog opportunities. Aside from common guest blogging searches like “write for us” and “guest post”, there is one search query that I failed to take advantage of when prospecting for content contribution opportunities. That is – the related advanced search function of Google. If you think you’ve already pulled off all guest blog opportunities in Google, then use related search query to add more sites to your spreadsheet. Instead of just following the footprints of your competitors, you can now create your own footprint by acquiring links from blogs where contents of your competitors may’ve not been placed on. This is one of my favourite content searching tools because it has filters that can help you narrow down search results to very specific content types. Simply type in your keyword/phrase in Buzzsumo’s search bar, then click search. Once done, you can filter the results by “Guest Posts” (simply check the filter option at the left side of the screen). You can also sort the results from highest to lowest social shares (can be in total/general or your preferred social sharing site). You may also want to export the list straight from Buzzsumo to have a database for guest blogs prospected from Buzzsumo. 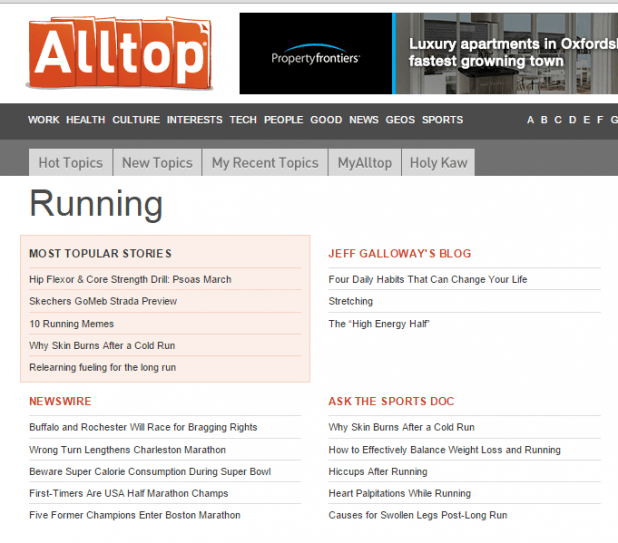 Alltop is an easy tool to find high quality and community-oriented blogs. Because Alltop has strict editorial guidelines when accepting blog directory submissions, you’ll rest assured that the blogs that you’ll find have high quality contents. One thing to consider in Alltop search is its suggested niches/topics that will pop up after typing a keyword/phrase in its search bar. You can find more relevant blogs when you click on those suggested topics. Qualifying your guest blog targets based on specific minimum standards can help you filter out low quality sites that’ll not contribute to the success of your brand’s guest blogging campaign. Domain authority (Moz’s metric) and trustflow (MajesticSEO’s metric) are initial qualifiers to identify the authority of a site/page. Domain and page authorities are numbers that you can easily see in Chrome extensions which can help you quickly determine if the blog in your list is good to go or not. Another qualifier you can consider is the number of linking root domains pointing to a specific blog. This metric doesn’t only give you numbers in your spreadsheet but it helps you determine if the blog managed to earn contextual links through its valuable contents (check if backlinks from linking pages are mostly in-content). When top heavy update was announced by Google, many websites with so many ads that buried down the contents in their homepages were penalized by the said search engine. In that case, when you’re looking for a blog to target for distributed content, you’ll have to see if multiple ads (of whatever type) are pushing down the contents in the page. If you find one, then remove that to your list of guest blogs. You should do the same if the content is not readable or poorly written. Relevancy should be the top priority when prospecting for link targets for your site. In guest blogging, you can look at the site’s categories to see if they’re tapping too many niches and industry communities. Filter out blogs with multiple categories across many niches since relevancy of those domains are mostly diluted and they tend to focus on several groups of readers without any emphasis on which industry they can build authority on. Another consideration you should take on is the health of that specific guest blog. Was it hit by an algorithmic penalty (e.g. Panda)? Use SEMRush to see the historical data of the site particularly on its organic search data. Then refer to this Google algorithm change guide on Moz to check if the site was hit by a content/link-based penalty on a specific date/month. Those blog qualifiers I mentioned above can help you refine you list of blog targets so you can get the best results out of your guest blogging efforts. Let’s move on to outreach. Outreach is the phase in guest blogging where you can actually engage with the guest blog target whether you are applying for a regular content contributor or as a one-time guest blogger. This stage starts with finding the contact information (i.e. name and email address) of the person you’d like to connect with. Check out the blog’s branded pages (About me, Our Team, Contact us). Get the possible corporate email of your link prospect by using VoilaNorbert. Use RankCracker (Matt’s free tool) to extract possible email addresses found in a list of URL’s. Once you’ve identified the email addresses of your guest blog targets, it’s time to send them a guest blogging pitch. In this case, you have two options: use Buzzstream (paid tool) or an email management system – combined tools of Gmail and RightInbox (which costs $5 per month) or Boomerang. When pitching to guest blog targets, it’s very important to personalize your email towards the interests of your recipient. You can download a free copy of my outreach template below. It also includes the template I use to followup with people if they don’t response within a week. Feel free to edit & use those templates in your own campaigns! When you get a positive response – accepting you to become the blog’s regular content contributor or a guest blogger, you may now proceed to the content creation phase. Creating content is a common work for search professionals these days. However, there’re still some marketers who are not producing great content output for the reason that they don’t have a simple process to follow. Create an outline for a specific article and guest blog, which will include the URL pointing to the blog’s guest blogging guidelines, writing instructions, voice and tone of the article, pages of the client needed to be linked to and deadline of completion. Submit the outline to the in-house writer or you can outsource it if you don’t have full time writers. Let the content writer finish the article within the expected turnaround time. Send the draft to the blog manager and to client (optional) for feedback and approval. Edit the content if necessary, which will depend on the discretion of the blog manager/client. Submit the proofread article to the guest blog target and ask for feedback. Follow up after one week if the bloggers/webmaster didn’t respond. Pro tip: Use Trello to easily manage your content creation process. Once the content is published, you don’t want to leave your post behind. Start engaging with the community readers of the guest blog. It is very essential to solidify your connections with your guest blogging prospects to build an alliance that’ll benefit both parties (in terms of promoting other brand’s content, absorbing blog readers and social followers for both sides and attracting more contextual links – but not in a reciprocal way). Participate in discussions in the comment section of your guest post (there might be some questions needed to be answered). Share new content assets (blog posts) of your guest blog target. Link to high quality content of your guest blog from your site’s internal content (when both pages are relevant to each other). So there you have it – an effective and easy to follow guest posting process to help drive your site to success. This guest blogging process will not only help your website earn links consistently every month but it will also guarantee that it will improve your site’s branding presence online while building traffic. If you have any questions please feel free to ask in the comments! 1st to comment again! Love your e-mails and in depth reports! Nice guideline for guest posting… its true that relevant theme guest posting still works best for top ranking…. Appreciate & Thanks for Great Post. BTW, add one more thing in the Blog qualifier list – Social Media brand of the blog. I would add Sidekick by Hubspot to the list of useful email tools. Tracks email opens (in real time) and helps split test subject lines etc. Very useful for refining your outreach. Great tip David. :) Boomerang and Yesware are good email outreach tools, too. Article is awesome and good deep inside. i have read many articles on “Guest Blog Posting” defenitily i can say that is awesome article, i have ever read. Thanks for sharing with us. i am sharing on G+ ..
Great stuff! I have not had much success with guestblogging, but I have also not put a lot into it- just casual outreach. I was/am certainly not doing a few of the steps here in your article, including some follow up. I downloaded your template, going to give it a try out this week. One question for you- when you reach out on behalf of your clients, do you reach out as yourself with your email? Or do you use a client branded email? It seems to me that if I (a SEO) reach out to a golf course blog about turf maintenance (client) they might look at it like I am just a marketer looking for links. There isn’t a right answer to your question, this really depends upon what the client wants. Some of you are happy for them to act under your brand while others want to distance themselves from it. I normally use client’s branded email as it looks professional in outreach, and of course, if you use your own gmail account or a corporate account (with your SEO agency’s domain in place – e.g. [email protected]), your potential linkers might be doing some research on you and find that you’re an SEO (they might be thinking that you’re only doing outreach for links). Guest blogging works today, but nobody knows about tomorrow. These days Google going to be very smart and stop almost all the techniques which are using by various Internet marketers for link building. Well its important you understand that the truth of the matter is there is no such thing as white hat or black hat. There is simple a single algorithm we have to fit within. These are in fact fantastic ideas in about Guest blogging. up writing Tips to Help Ranking in SERP. I like this full in depth article. I am doing the same way and I never listen people if they will say guest blogging doesn’t work. What have your results looked like? Article is awesome and good deep inside. you covered all sides about guest posting. i will try to work on it. PRO TIP: Don’t write for them who say “Write for us”!! Would this work for any industry? One of my most passionate niches is screenwriting and I have a fairly new blog that I’d like to promote and get my name out there as a consultant. Thanks. Please correct your headline to match your page title. You’re spit testing a headline that can be perceived – or perhaps IS — racist? WHITE versus White HAT?? Surely not. Please tell me not. How does the colour white and the colour black in context of a post about link building constitute racism? Not everything that is white or black is about race – FYI I prefer white chocolate over dark chocolate. So just what are the elements you’re split testing? For guest blogging, how often do you think the people at the other blog look at your website? I mean, do they just go on the front page and just look around or do they go to the blog section or whatever? What I’m scared about is that my content isn’t really exactly Tolkien. I mean, it is pretty informational but doesn’t have that extra chemical X. So I’m like, you’re always preaching CONTENT IS KING and everything, I’m scared that they’ll just dismiss my site as sketchy or spammy or whatever. So, if you could clear up some insecurities, I would be grateful. Well if its looks spammy, it will be percieved as spammy – at the end of the day your just emailing a person and asking them a question, what is there to be scared of? Okay, so I took your advice and tried to make my website guest blogger worthy. I don’t know if the content is good because, well, I’m not good at perceiving that stuff. If you could click my name, would my site look guest blogger worthy to you? Thanks for the writing this really informative post. I am quite impressed with your post. Great article, Matthew. Guest posting a few years back was quite a different story with article spinners, article farms, etc. This is a great guide for modern-day approaches to content marketing. Take care! Hi Matt, newbie question here…. would this strategy work for ranking a local business. I am looking to rank my (.ie) site for geo keywords. Would i need to post on local sites only or would there be a more suitable strategy i should follow? Thanks for your valuable post David.. I agreed with your term Guest post isn’t dead but if you use in the right manner. I read the mattcutts blog post regarding the guest post in the year of 2014 & most webmasters feel panic while getting links from guest posting website. Great Post! Do you consider it risky seo practice to place both a contextual link to a relative internal link to my site and then add an Author Bio link to my home page and social sites? Great content as always. Quick question, though. How do you go about “nofollow” links when prospecting potential blogs? One reason I gave up on this type of outreach was because 99% of the blogs that I found were placing the “rel=nofollow” on my links (non-negotiable). I started sorting through blogs by looking at previous contributors’ articles and whether or not their links were nofollow. It became very time consuming, and so I just went back to building PBNs lol :). Do you have a way of quickly checking nofollow vs dofollow links on a blog before reaching out? No but you can do some quick manual checks on previous guest post to see whats up, but honestly – I don’t worry about nofollow anymore. So this is that kind of blog post about guest posting that I had been looking for a while. BTW, when it comes to guest posting, the most tough step to go through is outreaching. Since you have done so many hard works before, and if you’re not getting reply, it’s painful. I also read your follow-up email template, as well as template for outreaching – both are amazing. Just added these templates into my Notepad file. Hopefully, it’s gonna be helpful. Thanks Shakir, I hope you reach the success you deserve! Thanks for sharing guest blogging information. I need to this info and I got it. Also I am applied same steps for guest blogging. Thanks once again. This is such an interesting post, I have been thinking about going self hosted for a long time and haven’t taken the leap yet. The reason being everything seems so complicated but your post is really helpful and easy to read so I will be coming back in the future when I do go self hosted. Ethnic content to read and learn! very well ! Great stuff to read and use in their marketing strategies!